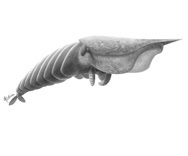 A 500-million-year-old fossil of a seemingly hooded little predator (about the size of a shrimp) was discovered "lurking in the depths of the Royal Ontario Museum's fossil collection." (Globe and Mail) The little monster has a couple of claws, eyes (they had those half-a-billion years ago!?) several layers of teeth and a "hard carapace that jutted out from its head." What's it for? The hard carapace? Scientists have no idea. The fossil was originally pulled from a pit full of fossils in Yoho National Park (British Columbia) in 1909. Over the last century, it's been misidentified a few times. For example, the mouth fossil was thought to be a jellyfish. And it was only recently that they put the whole thing together. But give researchers some credit. The fossil, what one expert described as "roadkill," was almost completely flattened by hundreds of millions of years of geologic activity. And when a mangled specimen like that comes in, "it takes imagination and patience" to see what they truly are.